Treatment for these conditions may include: drug treatment (for infections), Tympanoplasty (surgical procedure to repair holes in the eardrum), Tympanostomy (ear tubes), or other procedures. Audiology is the study of hearing and balance, its disorders, and the rehabilitation of individuals with these impairments. Our audiologists hold a Doctoral degree in audiology and can evaluate an individual’s hearing to determine the nature and extent of hearing loss, make medical referrals if necessary, and provide appropriate treatments. We have licensed audiologists and hearing aid experts on staff. Our audiology staff offers diagnostic testing for all age groups from the pediatric to geriatric populations. We offer hearing aid evaluations and fittings for a wide array of current digital technologies from renowned hearing aid companies. We offer hearing aid repairs, batteries, hearing aid accessories, custom earmolds, custom in-ear monitors, musicians’ earplugs, swimming ear protection devices, and assistive listening devices. Ask to talk to one of our hearing aid experts. Our audiologists will inform you about the various hearing aid choices and features that are appropriate for your hearing loss. They will assess the impact that your hearing loss has had on your friends and family. Our hearing aid fitting program includes in-depth instruction on hearing aid wear and care, along with free visits to insure that the hearing aids are fitted correctly to your hearing loss. A generous trial period and extended warranties are always included. Appointments can be made directly with an audiologist. Patients do not have to be seen by an ENT physician first for hearing evaluations. Hearing evaluations and hearing aid visits are performed by appointment only. Please contact our offices to make an appointment or if you have questions regarding hearing loss. To better determine whether you may have a hearing loss, please complete the Hearing Questionnaire. 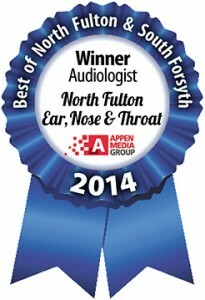 Please click here for more information about our Audiology department. for your hearing healthcare needs!